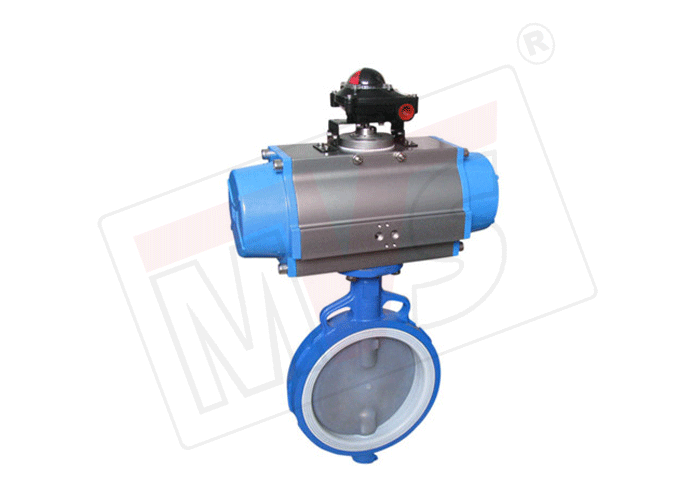 MVS Replaceable or Resilient PTFE Seated Butterfly Valve is available in pressure rating of PN 10. 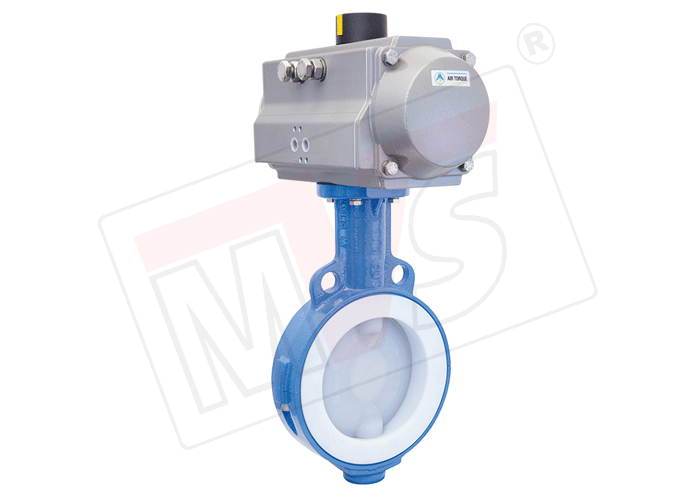 MVS PTFE Seat Butterfly Valve is available in Split 2 Piece Body and Disc Material of Cast Iron, SG Iron, Carbon Steel (WCB), SS 304 (CF8), SS 316 (CF8M). Our Resilient Seat Butterfly Valve comes with replaceable PTFE Seat. 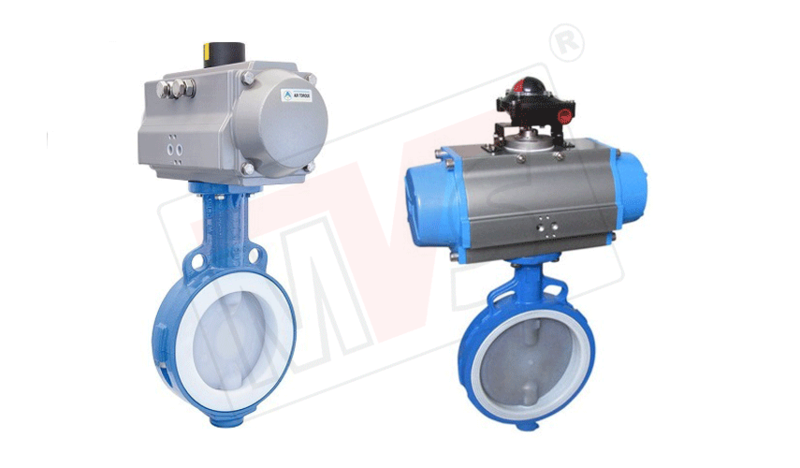 MVS PTFE Seated Butterfly Valve Operation options include Lever, Gear Unit, Motorised, Electrical Actuator, Pneumatic Actuator (Double / Single Acting). MVS PTFE Seated Butterfly Valve can also be supplied with special arrangement of Long Neck, Extended Stem, Locking Arrangement, Limit Switch and Chain Wheel Operator. It provides an optimum solution to the corrosion problems encountered by the chemical process industries with conventional Butterfly valves. The PTFE seat liner covers the entire wetted surface of the body and extends on to the flange contact faces, thus eliminating possibility of any media contact with the body metal. The circularly moulded full back up elastomer and live loaded disc shoulder sealing ensures bubble tight closing of the Valve with zero shaft leakage. 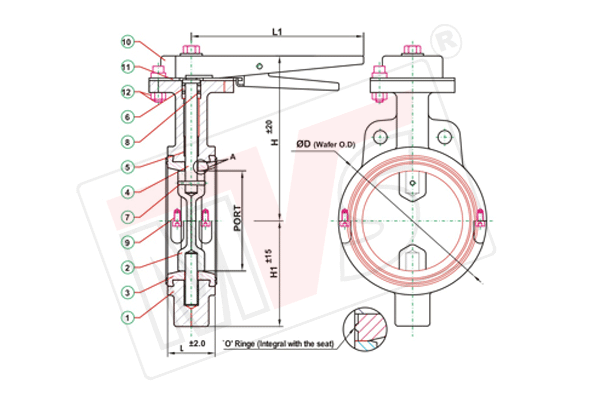 The valve is adaptable for ON / OFF as well as control duty and can be fitted with actuators and accessories as required to meet the specific duty conditions. Body (Split 2 Piece) & Disc : ASTM A 126 GR. B / IS 210 GR. FG 200/220/260 (Cast Iron) / Ductile Iron / Nodular C.I. Full PN 10 pressure rating for the entire range of valve sizes from DN 50 to DN 300. Bi-directional valve with sealing capability to hold rated shut off pressure in either direction. Circularly moulded back up elastomer provides uniform contact pressure over the entire seat without losing shaft bore shape, ensuring bubble tight closure every time. Unique triple sealing system for shaft sealing, eliminates any fugitive emission or secondary leakage. Self lubricated shaft bearings (PTFE coated stainless steel) for both drive end and non-drive end shaft ensures minimum bearing friction torque. Live loaded disc shoulder sealing arrangement through pusher and disc springs in both top and bottom shaft bores, acting on PTFE liner ensures leak free mechanical stem seal. Back up elastomer standardised in Viton to ensure excellent corrosion protection and maximum temperature resistance against media fumes and higher temperature. Disc springs and fasteners standardised on corrosion resistant stainless steel to ensure long service. A choice of exotic metallurgy for the disc, to meet any type of aggressive media. Choice of liner materials of virgin PTFE or filled PTFE, which also extends on to the flange contact faces. Low operating torque enables selection of smaller size actuators. Perfect adaptability for conversion from manual to actuated operation due to standardized top flange.